At least one spouse must have lived in Michigan for at least 180 days before the divorce is filed. Michigan is a no-fault divorce state. In a Michigan no-fault divorce the spouses agree that there has been a "breakdown of the marriage relationship" and there remains no reasonable likelihood that the marriage can be preserved. You review and sign the documents, then file the Michigan Complaint for Divorce. File the remaining documents by mail or in person. A judge completes your divorce by signing your Judgment of Divorce. Property division, debts, alimony, child parenting plan (includes custody, visitation, and Michigan compliant child support calculation), and more are covered. DivorceWriter offers a money back guarantee if your documents are not accepted by the Court. 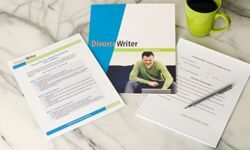 You have qualified to use DivorceWriter to complete your Michigan divorce papers online. Select "Continue" to start the interview.